There are many ways you can help promote this important event. Safely dispose of unwanted and expired prescription medications during National Prescription Drug Take Back Day on Saturday, April 26th from 10am-2pm at one of six locations in Windham County, Vermont. All types of medications will be collected including sharps, liquids, pills and patches. Safe disposal of medications during Take Back Day prevents contamination of waterways and reduces the opportunity for medications to be misused by others. 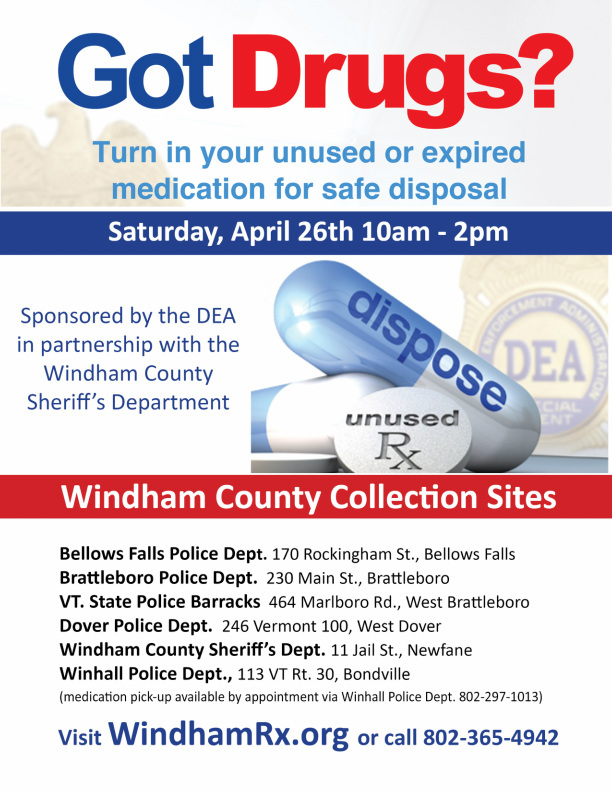 Take Back Day Press Release from the Windham County Sheriff's Department. Download the Take Back Day facebook cover photo image and add it on your facebook page. Click here to download the Poster as a PDF to hang on your bulletin board or post in your business.